In this tutorial we will exploit enhanced sampling molecular dynamics, namely metadynamics  to improve the predictive power of molecular docking of small ligands to a protein target in the framework of an ensemble docking strategy . Molecular docking is a widely used technique employed in Computer-Aided Drug Design  with the aim to drastically reduce the cost associated with the development of new drugs. A docking algorithm can be grossly split into two main tasks: i) the search for putative binding poses of the ligand onto the selected protein target(s); ii) the ranking of all generated poses, according to a given “scoring function” which should reproduce at best the free energy of binding of the complex. 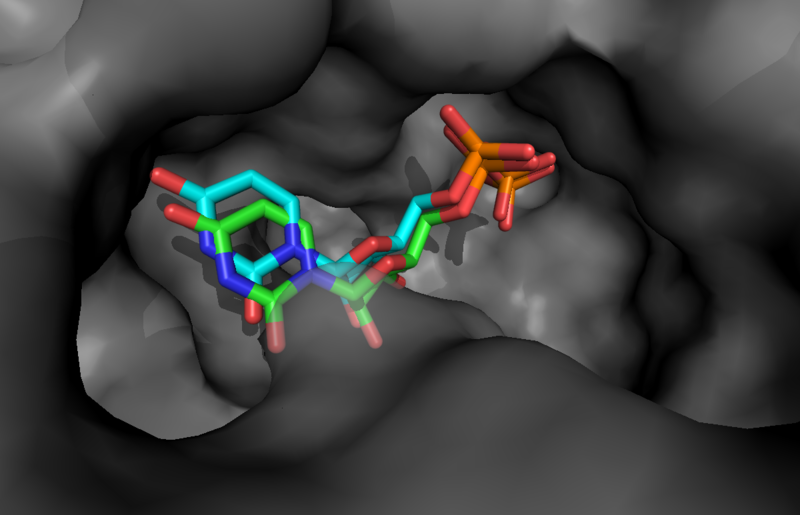 Docking is also the main computational method employed in virtual screening (VS) campaigns aiming to the identification of putative drug candidates in silico [3,4,5]. Clearly, a VS calculation should correctly rank native-like poses as the top ones, thus assigning them the highest score (i.e. the lowest binding free energy). Both the above tasks i) and ii) can be implemented in different ways, however, they are both subject to failures due to the intrinsic limitations of docking algorithms. Examples of these limitations include the reduced ability to sample conformations of the binding site in the presence of ligands and the difficulties associated to correctly account for entropic and de-solvation contributions in the scoring functions [3,4,6]. The sampling problem, which is the focus of the present tutorial, is a crucial issue in presence of significant structural changes of the protein receptor due to the interaction with ligands (mechanism known as induced fit , which induces at least changes in the orientation of side chains and more generally in the shape of the binding site. This is particularly relevant in the search for new drug candidates, for which experimental information regarding their complexes with the target protein is not always available. Several methods were developed in the past decades to deal with this issue, but a general and successful approach is still missing [6,8]. Among them, the ensemble-docking method was developed with the aim to account for the plasticity of the receptor by performing docking on multiple conformations obtained from experimental or computational means. The advantage of using multiple conformations is the increased probability to have in the pool of structures at least one featuring a bound-like conformation of the binding site, suitable to optimally dock the correct ligand(s). This approach was shown to improve the outcome of docking and VS calculations in many works published in the last years [2,3,5]. In this tutorial we will show how to further improve the predictive power of molecular docking in cases where even a long unbiased MD simulation is unable to generate bound-like conformations of a known difficult target. In particular, we consider the T4 phage beta-glucosyltransferase, which shows a large distortion at the binding site upon binding of its uridine diposphate substrate. Different conformations of the protein generated by enhanced-sampling MD simulations will be used in multiple docking runs with the HADDOCK2.2 webserver . The results will be compared with those obtained using an ensemble of protein structures generated by a plain MD simulation of the apo system. Throughout the tutorial, coloured text will be used to refer to questions or instructions. This is a question prompt: try answering it! This is an instruction prompt: follow it! This is a VMD prompt: write this in the Tk Console! This is a Linux prompt: insert the commands in the terminal! What should you check before using a pdb file downloaded from the RCBS databank? starting with the string “REMARK 470”). Next, we fill the box containing our protein with water molecules, and save the corresponding structure and topology files. We will first copy the protein topology file apo_GLUCO.top into apo-solv.top in order to use the last file for the remaining steps and to keep the apo_GLUCO.top as a backup file. We are now ready to generate the GROMACS input file (tpr extension), a binary file containing all the information needed to perform the requested calculations on the system of interest. This is done with the grompp command, which needs both the structure and the topology files and also an input file (mdp extension) containing the directives to run the simulation (such as simulation type, pressure and temperature control flags, treatment of long-range interaction flags, flags related to the information to be printed and so on). 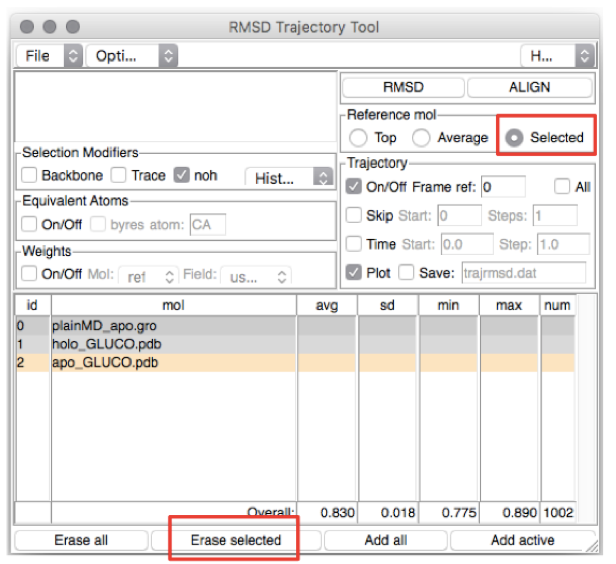 The file em-pbc.mdp (available in the folder tutorial_files/apoMD) sets the typical parameters needed to run a structural relaxation of the system, which allows to (partially) remove the steric hindrance due to clashing contacts between atoms of the protein and/or solvent. The tool grompp checks on the fly the values given to the parameters present in the mdp file, and generates possible notes and warnings. By default, the program fails when some warnings are generated, but the user can change this behavior by setting the “-maxwarn” flag to values larger than 0 (clearly after ensuring that all the warnings raised are “safe”). The following output will appear, prompting to select the group of solvent molecules for ions substitution. Six molecules of the selected group will be replaced by chlorine ions. Will try to add 0 K ions and 6 CL ions. You could have a look to this file with your preferred text editor. It consists of entries starting with [ namegroup ], followed by lines reporting the serial numbers of atoms within that group. Wait a few seconds and check the output file em-pbc.log to understand if your run was successful. The next step after structural relaxation is to perform a MD simulation slowly heating the system up to the desired temperature. To save time here we will set the temperature to 300 K quite abruptly. The file equil-pbc.mdp (available in the folder tutorial_files/apoMD) contains the directives on how to perform the MD simulation with explicit water and under periodic boundary conditions. 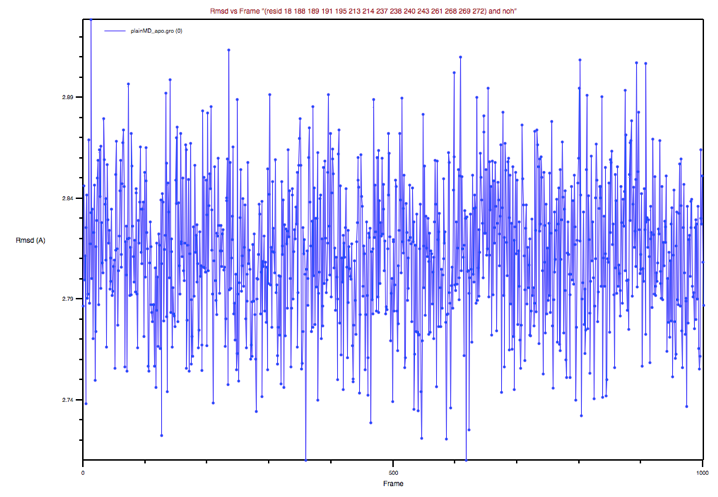 Let the simulation go or kill the job (kill -9 <PID>; when needed, you could use pre-calculated data). We are going to perform metadynamics simulations using GROMACS 2016.5 and PLUMED2.3.5, a plugin facilitating the implementation of different kinds of enhanced sampling techniques (and not only) in several simulation packages, using the same syntax independently of the specific engine used. Briefly, metadynamics is an enhanced-sampling technique, developed by Laio and Parrinello about 15 years ago . It enforces systems to escape free energy minima by means of a history-dependent fictitious potential. The system is thus forced to explore conformations associated to other (meta)stable basins and/or free energy barriers. This is achieved by defining a set of collective variables (CVs, e.g. a distance, an angle, a dihedral angle and the number of contacts between two groups of atoms) which identify the relevant motions to be enhanced in order to steer the sampling of otherwise unreachable conformations. The exploration of the CVs phase space (which “drags” the system towards atomic conformations otherwise rarely visited) is forced through the deposition of “hills”, namely Gaussian-like potentials, added every nG steps of the simulation to the CVs space at the point corresponding to the system’s state. These Gaussian hills will generate a repulsive force which is transmitted to the real atoms of the system thus enhancing the conformational sampling. Clearly, a good CV should be associated with a “slow” motion of the system (in absence of bias), so that its value at conformations associated with different free energy basins will differ too. The choice of the CVs is indeed crucial to the success of a metadynamics simulation and some rules of thumbs to guide the choice of the height, width and deposition time have been outlined by Laio et al. . It was shown that under proper conditions, metadynamics generates, in the CVs space, a free energy landscape representing an unbiased estimate of the underlying free energy . Since its introduction, many flavors of metadynamics were introduced  whose description is out of the scope of this tutorial. Here we will use the so-called “Well Tempered Metadynamics” , that represents an improvement over the original algorithm thanks to the possibility of controlling the regions of the free energy surface that are physically meaningful to explore. Often a single CV is not sufficient to catch the relevant slow modes involved in the structural transition of interest. Indeed, all the CV-based methods often exploit the use of multiple variables, which ideally should be orthogonal to each other to enhance the sampling along independent directions of the CV space. A clever method to enhance sampling across a virtually unlimited number of CVs is the so-called bias-exchange metadynamics . In bias-exchange metadynamics many simulations of the system at the same temperature are performed, biasing each replica with a time-dependent potential added to a different CV. Exchanges between the bias potentials in the different variables are periodically allowed according to a replica exchange scheme. Due to the efficaciously multidimensional nature of the bias, the method allows to explore complex free energy landscapes with high efficiency. In order to perform a metadynamics simulation, we need first to define our CVs. Here we will enhance the conformational sampling locally at the binding site (BS) of the apo-form of GLUCO, by biasing both the radius of gyration of the BS as well as the intramolecular contacts among the residues lining that site. You will see a VMD Main window, as well as a Display and a Graphics representation window. And a similar list containing the atom numbers (serials) of BP’s residues. You will get the value (in Å) corresponding to the RoG of the BP (take a note as we will need this value later). Now you can close VMD. As you will see below, PLUMED  needs atomic serial numbers as input. Thus, to perform the simulation, we should get the list of serial numbers defining the BP. We thus load the apo protein ready to be simulated into VMD and use the residue list obtained previously to print the list of serials defining the BS. Go to the ../MD/plain directory and copy there the em-pbc.gro file from the tutorial_files folder. Now open it on VMD. Note that with the previous commands we also calculated the value of the RoG of the BP for the apo structure, as we will also need this value later. Keep in mind that if you extract the serial number from the apo_GLUCO.pdb file, you will obtain different serial numbers (and this can happen with other systems as well, if different residues/atoms were unresolved in the apo and holo structures), not corresponding to the binding pocket atoms in the system that you are going to simulate! You should always cross-check the serial list before running the simulation! You should see the menu displayed in Figure 3. 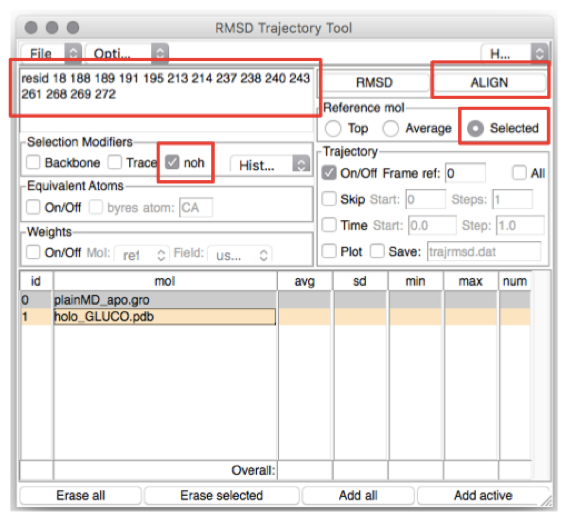 Let’s first estimate the RMSD from the holo experimental structure. We could remove the apo experimental structure from the list of structures by selecting the last line (corresponding to ID 2) and pressing Erase Selected, after making sure the button Selected is marked. In the top-left box type the residues you want to (align and) calculate the RMSD of (in this case, the residues lining the BS). The list of residues is found in the file BS_resid_numbers.dat in the Xray folder. Alternatively, you can find them in the top-left red box in Figure 4. Now click on the line corresponding to holo_GLUCO.pdb (ID 1) and tick Selected in the “Reference mol” box (see Figure 4). Click on the ALIGN button (top-right red box in Figure 4). Could you comment on this plot? 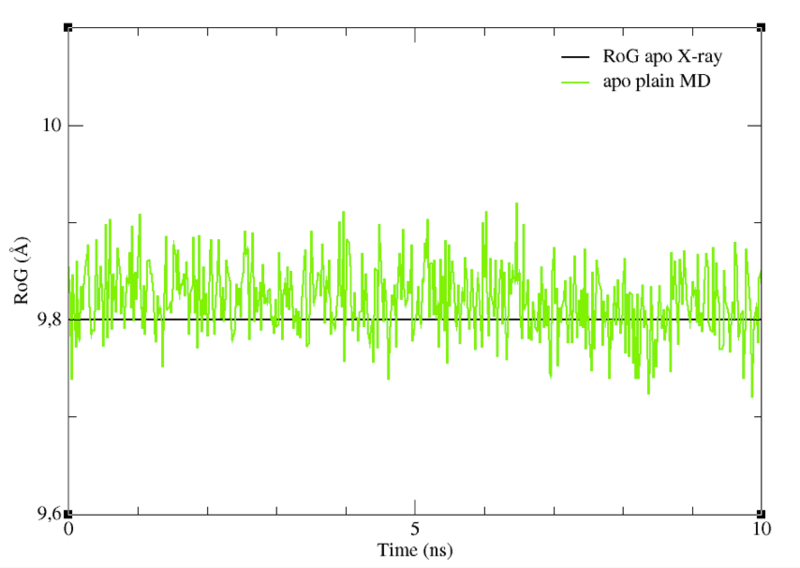 Now repeat the procedure above to estimate the RMSD of the BS from the apo experimental structure. Note that you could bring back the apo_GLUCO.pdb file by clicking on the Add all button adjacent to the Erase Selected button that we used previously. Then you could delete the holo_GLUCO.pdb molecule from the list and proceed as above. You should obtain a graph like that shown in Figure 6. Could you comment on this plot and its comparison to the previous one? The output file COLVAR_driver lists the values of the CVs sampled along the trajectory. (you can find a pre-calculated file in the tutorial_files/Driver folder). To assess how much the CVs changed during the unbiased MD simulation, plot their values with your preferred graph viewer. Here we will use xmgrace. You will see a graph like that in Figure 7, showing the RoG of the BS of the structures sampled, together with the RoG for the experimental structures. A similar plot could be easily obtained also for the other CV chosen. Figure 7: The RoG of the structures sampled during the apoMD simulation. Despite it is preferable to perform these analyses on longer trajectories, you can see already from this graph that the CV we selected did not change significantly. Thus, they could be a good choice as CVs to enhance the sampling of different shapes and volumes of the BS. The standard deviations of RoG and NCs will be used to set up the following metadynamics run. plumed.0.dat, plumed.1.dat. Each file contains the directive to read the plumed-common.dat file, as well as information on the bias to be applied to the related CV (such as its height and the frequency of deposition of the energy hills). In this case, we set the value of the bias factor to the default of 10. Instructions on names and writing-frequency of output files are also given. Open and read plumed-common.dat to understand clearly all the instructions. As you can see the list of the atomic serial numbers is already encoded in the file. If not, you should insert the list of serials previously extracted. Open now plumed.0.dat and plumed.1.dat and insert the appropriate value of the sigma parameter where needed. You should have calculated the w parameter (sigma) values in the previous section of this tutorial by means of the av_std-sel-region-column.sh script. The flag “-replex” is used to specify th frequency of attempts to exchange the bias between the two replicas. Wait for a few minutes and check the content of the directory. If the files COLVAR.X and HILLS.X are being written (you can easily check with cat <filename> or wc -l <filename>) it means your simulation is running. 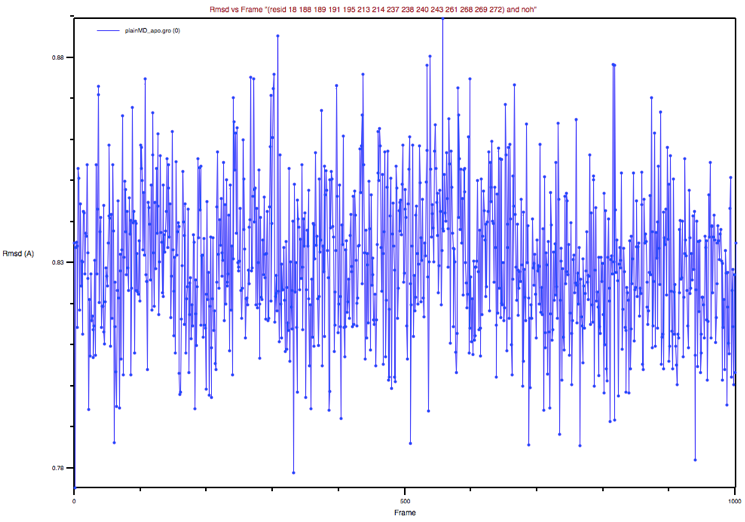 As for the previous simulation, you can use pre-calculated data to analyze the trajectory. You should see a plot which looks like the one in Figure 8. Figure 8: The RoG of the structures sampled during the BE-META simulation for both replicas, plotted against the experimental value of apo structure’s RoG. Based on the RoG values displayed in the plot, what can you say about the structures sampled by both simulations? The simulation just performed and analyzed didn’t have any restraints on the values of the CVs. Although in principle they should sample all the conformational space available, in facts it could take a very long time to do so. To force sampling towards a predefined direction, you could insert some restraints on the CVs (a reader interested in how to set restraints during a metadynamics simulation with PLUMED can have a look here. 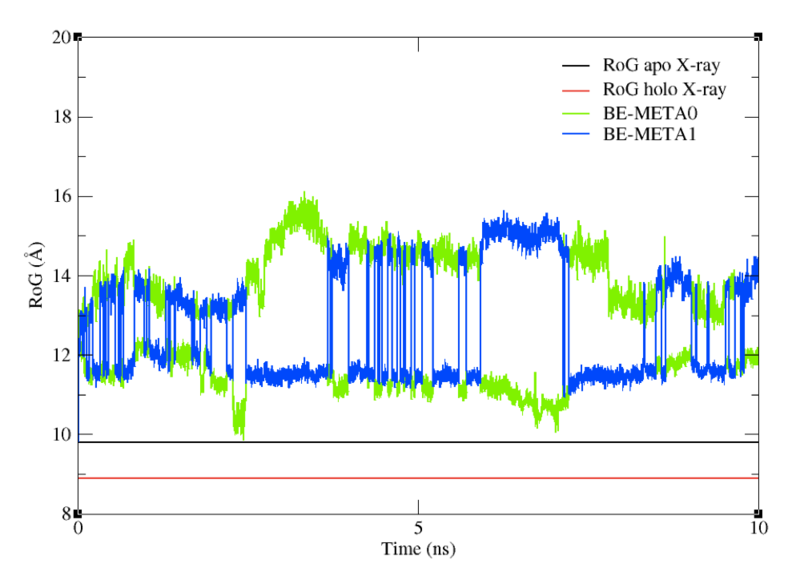 You can now compare the above graph with the following one (Figure 9), obtained from a metadynamics simulation with the same set-up as above, but featuring restraints on the RoG. Upper restraints were used on the RoG to force the system to explore conformations associated to smaller values than the initial one. By tuning the restraints according to your specific aims, you can force the sampling towards a given region of the conformational space. 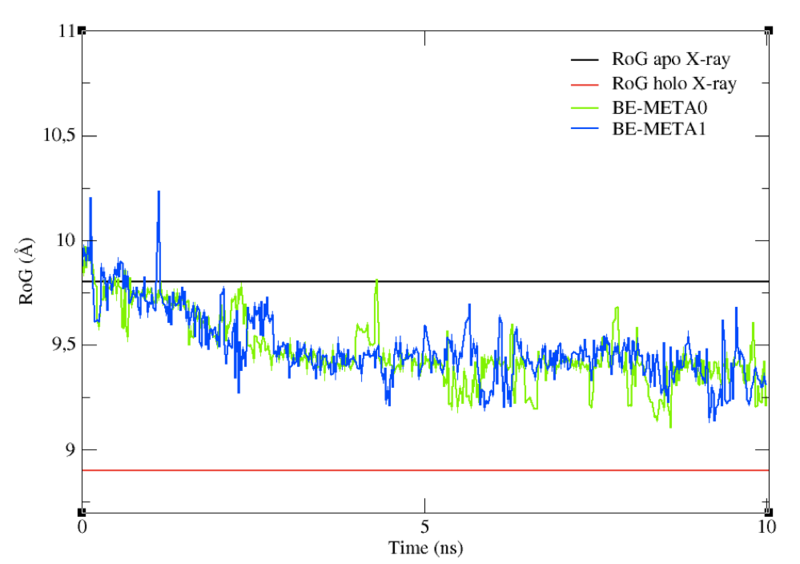 Figure 9: The effect on upper restraints of the RoG of the structures sampled. What are the main differences between your plot and this one, in which upper restraints were used on the RoG? To perform ensemble-docking runs a cluster analysis  must be performed so as to pick up a set of representative structures sampled by the protein (it would not be feasible to perform docking calculations on all of the structures sampled along MD simulations). Of course, while reducing the number of structures to consider, a good cluster analysis procedure should maximize the diversity of conformations sampled by the BP. In this way, if conformations prone to host the ligand were sampled during MD simulations, at least a representative for that “conformational mode” will be included in the pool of clusters that we are using for docking. Performing a successful cluster analysis, namely being able to actually include representatives of all the “conformational mode” remains a difficult task, and a lot of recipes have been proposed during the years . Here we will perform a simple cluster analysis using the tool “cluster” within the GROMACS 2016 package with an RMSD cut-off of 2 angstroms on the BS. Type 18 to select the binding site region. Now, another output will be prompted, asking you what part of the protein we want to be written in the pdb file of each cluster. Of course, since we need to run docking calculations on those structures, we need the entire protein without water molecules. Type 1 and the cluster analysis will start. This calculation can take up to several hours and for this reason we have already pre-calculated 10 clusters coming from the apo plain MD and 10 clusters coming from the BE-META. These simulations were from 10 to 100 times longer than the ones performed in this tutorial (clearly, 10 ns are not enough to allow the binding pocket to reach the RoG of the holo X-ray structure). You can find the clusters needed for the subsequent docking calculations in ../../tutorial_files/cluster_analysis/clusters_ready/. Note that protein-ligand HADDOCKing typically requires fine-tuning a handful of parameters that requires the most advanced privilege on the web server. If you did not apply for the “guru” access level yet, it is time to apply for it via our registration portal. Alternatively, you can use the course credentials that were provided to you during the summer school to submit your docking runs. Please, use the pre-calculated runs to move on with the analysis section. For the rigid-body docking, we will first define the entire binding pocket on the receptor as active and the ligand as active too. This will ensure that the ligand is properly drawn inside the binding pocket. For the subsequent flexible refinement stages, we define the binding pocket only as passive and the ligand as active. This ensures that the ligand can explore the binding pocket. Note: This works best with Firefox. Currently when using Chrome, saving as text writes the wrong info to file. In that case copy the content of the page and paste it in a text file. Note: Avoid Safari for the time being - it is giving problems (we are working on it). Compare the two generated files: what are the differences? How many restraints are defined in each? S.J. de Vries, M. van Dijk and A.M.J.J. Bonvin. The HADDOCK web server for data-driven biomolecular docking. Nature Protocols, 5, 883-897 (2010). Download the final author version here. Step1: Define a name for your docking run, e.g. bemeta-ensemble or apoMD_ensemble. Step2: Prepare the ensemble of 10 conformations that you will provide as starting structure for the protein. HADDOCK accepts ensembles of conformations as starting files, provided all the coordinates are concatenated in one single PDB file and all the conformations contain EXACTLY the same atoms (same number, same names, same chain/segid, …). And easy way to prepare the “bemeta” and “apoMD” ensembles from the clusters files provided in the folder ../../tutorial_files/cluster_analysis/clusters_ready/ is to use pdb-tools. Step3: Input the protein PDB file. For this unfold the Molecule definition menu. Step 4. Input the ligand PDB file. For this unfold the Molecule definition menu. Note: The coordinates of the ligand atoms must be submitted as HETATM and the residue number set to 1. You can download here the ligand coordinates if you want to proceed directly. Since the structure of the ligand is directly obrained from the reference crystal structure of the complex, we can disable the flexibility of the ligand to enforce the bound conformation of the ligand in our models. Note: HADDOCK deletes by default all hydrogens except those bonded to a polar atom (N, O). In the case of protein-ligand docking however, we typically keep the non-polar hydrogens. Step 10: You are ready to submit! Enter your username and password (or the course credentials provided to you). Remember that for this interface you do need guru access. Upon submission you will first be presented with a web page containing a link to the results page, but also an importantly a link to a haddockparameter file (simple text format) containing all settings and input data of your run. During this stage the PDB and eventually provided restraint files are being validated. Further the server makes use of Molprobity to check side-chain conformations, eventually swap them (e.g. for asparagines) and define the protonation state of histidine residues. Once this has been successfully done, the page will indicated that your job is first QUEUED, and then RUNNING. The page will automatically refresh and the results will appear upon completions (which can take between 1/2 hour to several hours depending on the size of your system and the load of the server). You will be notified by email once your job has successfully completed. Once your run has completed you will be presented with a result page showing the cluster statistics and some graphical representation of the data (and if registered, you will also be notified by email). If using course credentials provided to you, the number of models generated will have been decreased to allow the runs to complete within a reasonable amount of time. Inspect the result pages. How many clusters are generated? Note: The bottom of the page gives you some graphical representations of the results, showing the distribution of the solutions for various measures (HADDOCK score, van der Waals energy, …) as a function of the RMSD from the best generated model (the best scoring model). where Evdw is the intermolecular van der Waals energy, Eelec the intermolecular electrostatic energy, Edesol represents an empirical desolvation energy term adapted from Fernandez-Recio et al. J. Mol. Biol. 2004, and Eair the AIR energy. The cluster numbering reflects the size of the cluster, with cluster 1 being the most populated cluster. The various components of the HADDOCK score are also reported for each cluster on the results web page. Consider the cluster scores and their standard deviations. Is the top ranked cluster significantly better than the second one? (This is also reflected in the z-score). In case the scores of various clusters are within standard devatiation from each other, all should be considered as a valid solution for the docking. Ideally, some additional independent experimental information should be available to decide on the best solution. Let’s now visualise the various solutions! alter (resn UDP and holo_GLUCO), chain="B"
alter (resn UDP and holo_GLUCO), segi="B"
alter (resn UDP and holo_GLUCO), resi="1"
At last, we can remove water molecules (reference structure) and hydrogens to facilitate the visual comparison with the reference structure. Does the best cluster ranked by HADDOCK also correspond to the best (smallest) ligand-RMSD value? If not, what is the difference in orientation of the ligands between the top two clusters? If not, what is its rank? And is the HADDOCK score of this cluster significantly better than the best cluster? You have completed this tutorial. If you have any questions or suggestions, feel free to post on the dedicated topic on our interest group forum.